Electric guitar fans everywhere clap your nimble hands. Our favorite wizard (no, not the bespectacled Harry Potter) has unveiled his current live setup–or, you could say, his book of spells. 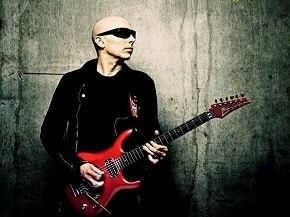 For those who don’t know, Joe Satriani is on his Wizards and Wormholes tour, where he’s showcasing songs from the new album, Black Swans and Wormhole Wizards, along with old classics like “Flying in a Blue Dream”, “Satch Boogie”, and “Andulusia”. While Satch has always been very down-to-earth and open to discussing guitar technique, it’s always a treat to get a glimpse of what goes down behind the tech-side of the curtain. 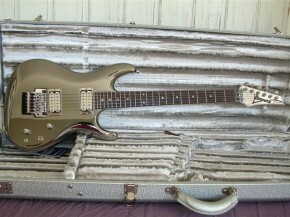 So first, let’s talk about his shiny family of Ibanez axes. He’s got an alder wood JS2410 prototype, painted hugger orange to match a ’73 Camero he took a fancy to once. 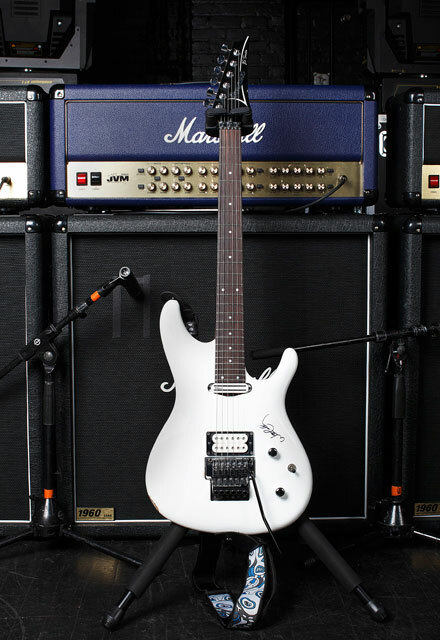 A super-thin bubinga stripe on the neck and an enhanced mid-range make for a slick ride, and Satch says that it’s second only to his primary guitar, a basswood JS2400 production in gloss white. The silver volume knob on this six-string has a small strip of white tape to provide easy visual confirmation that the levels are right for specific songs. The next alien weapon in his arsenal is a JS1200. Dipped in candy-apple red and fitted with a Sustainiac pickup, this instrument gives him that infinite feedback he utilizes on “Wind in the Trees”, “Why?”, and “Littleworth Lane”. The fourth and final guitar is straight acoustic, a JSA10BK in Satch’s favorite color: stone-polished jet black. But there’s a lot more to Satch’s trademark sound than just his guitars. 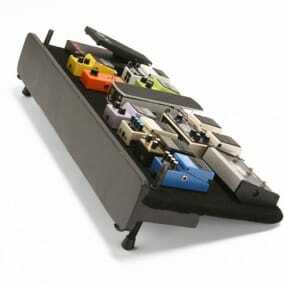 His pedalboard, which he describes as “minimal”, is a carefully orchestrated network of finely tuned boxes, pedals, cables, knobs, and foot switches. First and foremost is the Big Bad Wah by Vox, which gives him that “big throaty sound”. Next up is the Voodoo Lab Pro Octavia and the Boss Super Chorus, both of which are used to create the sounds on “Crystal Planet”. The Voodoo Vibe by Roger Mayor is what you hear when you listen to the solo in “Pyrrhic Victoria”. And then, of course, we have the three trademark Vox effects that are Satch’s core line-up: Ice 9 overdrive, the Satchurator, and the Time Machine. And then there is the “mysterious box.” It doesn’t look like much, but it allows Satch to access the DigiTech IPS-33B, the so-called super harmony machine that pushes out a “funky old rack effect” that will leave anyone wondering if dragons still exist on some smoke-covered mountain somewhere. The DigiTech is very fragile, though, and must be kept hidden backstage to avoid vibrations. 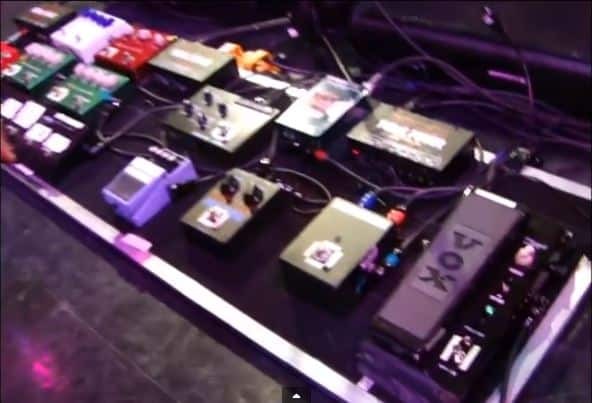 Connecting Satch’s pedal board to his amps is accomplished with a Marshall JVM 410 “six-banger” foot pedal. He uses three custom Marshall JVM 410 heads running into three 1960s bottoms. Santiago Alvarez, a Marshall engineer, juiced up the heads to make them sound “fuller and punchier,” which immediately becomes evident after Satch plugs in. 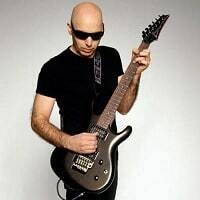 He uses one head for the show, one for back-up, and one for his guest guitarists, like Joe Petrucci. He uses 4 channels, 3 modes per channel, and a noise gate on each. Overall, it’s a clean system with capabilities for screamin’-demon highs and big fat slabs of low bass subsonics. And that’s it. Now you know the secrets of Professor Satchifunkilus himself. Just don’t be like Coldplay: use his effects, copy his technique, but for God’s sake–write your own music.